Almost but Not Quite. KLM Must See Map, no App. KLM has been a big participant in promotional marketing campaigns grounded in social media for sometime. The video below shows the latest from the Dutch airline. The “Must See Map” is built on suggestions of things to do, and places to see from friends responses to a social media query. It asks the traveler to simply ask friends in their social network where they have been and what they have done, then gathers all of this information into a single source. 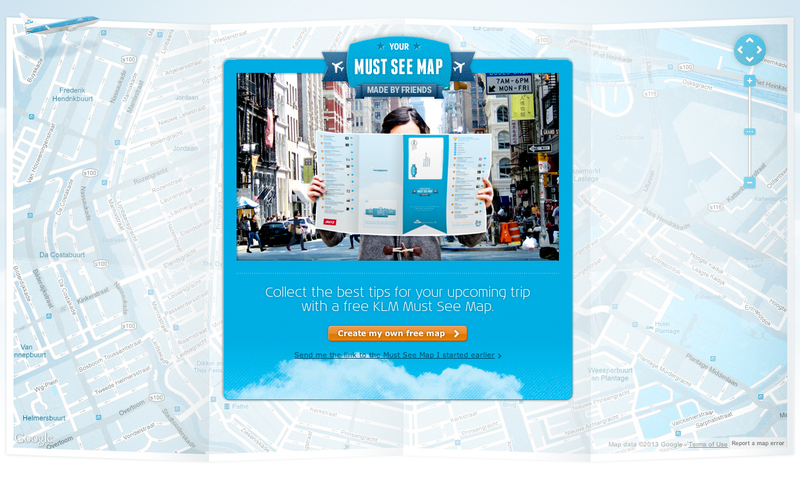 What is great about this campaign is the fact that KLM will send you a print on demand high-res physical map. What I don’t like is the fact that the map will take 3 weeks to arrive, and there is no dedicated smartphone app. The free online site does a great job of integrating with all of the major social network players, allowing the traveler to gather vast amounts of tips but offers no dedicated smartphone app. While the physical map is a cool souvenir for your trip, and ties to all the places your socially networked friends tell you to go; it is quite surprising that KLM didn’t take this one step further. A dedicated app is much easier to carry and use than a physical printed map. A dedicated app allows for recommendations to come to you long after the map is printed. A dedicated app allows the traveler to post feedback on friends recommendations. A dedicated app, takes the concept to a whole new level, and extends use far beyond the interaction of the website. This is a great concept, and I hope that KLM goes a little further with it. KLM currently has 10 apps that they have developed for the iPhone, so I could see them taking this to a whole new level. When they do, “Must See Map” will be a home run. Posted in Advertising, Innovation, Travel and tagged email, Facebook, Holland, iPhone, KLM, Must See Map, Print on Demand, Social Network, Social Networking, travel, Twitter on February 18, 2013 by Author.